I'm not one for loving all things vintage however I have always had a bit of a fascination with old advertisements. I actually can remember from the aged of 9 or 10 looking through old magazines from the 1950's and just being so interested at the difference products they use to sell and the little coupons you could cut out and take to Boots the Chemist or send off for a free little brochure. 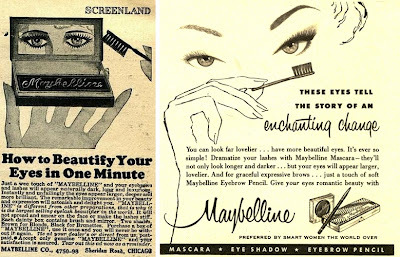 So I've done abit of research and found quite afew interesting beauty ad's - I especially love the really old ones, like the Maybelline mascara ad (below left)! Also love how elegant the Revlon ad's are - always loved the matching lipstick with nail polish idea from them. From what I could find Maybelline were one of the first to produce cake mascara back in 1917 (the ad above left was published in 1923). It would actually be interesting to try a cake mascara now to see what the actual results would be. 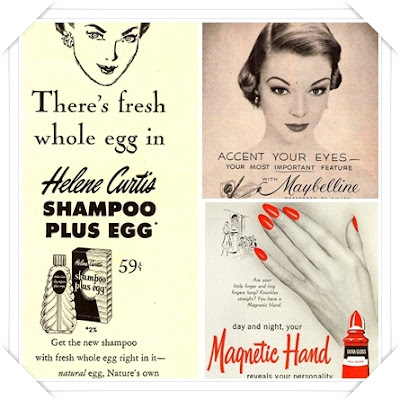 Also did you know the man that founded Maybelline actually named the brand after his older sister Mabel - how lovely. Number Seven & White Rain! No7 definitely went in for the more wordy ad it seems! Click on the image and have a read of the ad as there's some really interesting products - especially the Number Seven Skin Tonic 'A stimulating lotion, invaluable in districts where the water is too harsh for the face' and the Astringent Lotion 'for drooping muscles'! Also love the sound of White Rain Shampoo - I mean who wouldn't want to wash there hair in a shampoo that feels like the softest hair water! 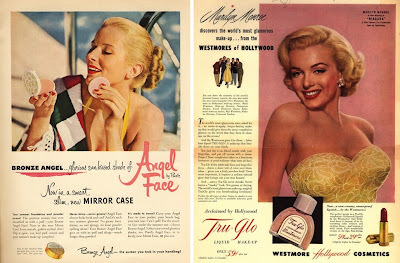 So elegant and chic - love the whole Hollywood glamor to all the old Max Factor ad's. The oldest one I could find is the advert on the left from 1941 advertising Pan-Cake which was very popular back then. They definitely don't do Pan Cake makeup anymore but they still have a foundation called Pan Stik - which seems the more retro of all the products Max Factor currently do, and by that I mean the packaging with the turn up stick foundation and it being quite a heavy creamy foundation. I think the Revlon ad's are my favourite of all time! So fun yet classy. 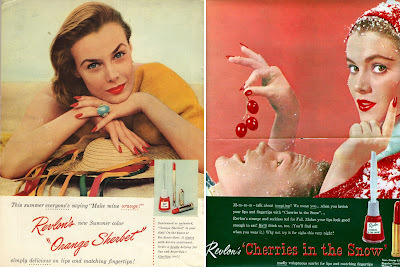 I did find two versions of the 'Cherries in the Snow' ad, but I loved the one above the most, so cute! I actually wish they made ad's like this still instead of some of the over sexualised adverts that are ever so present these days. Also just look at how chic the model looks on the left - just beautiful! Would love to know which vintage adverts you like the most from the ones above. Max factor is probably my fave, so glam! Revlon and Max Factor are my favourites. I love the Max Factor ads. 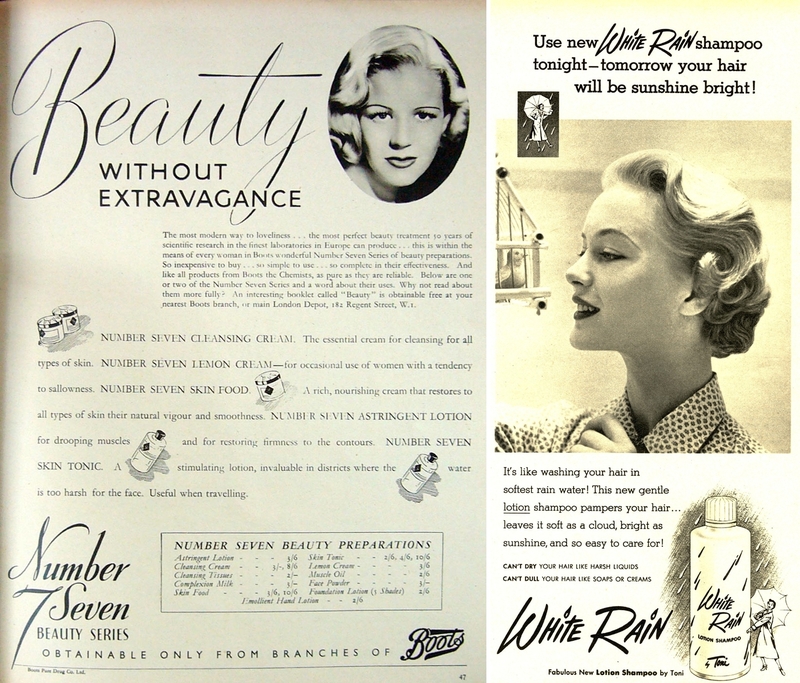 So gorgeous, I wish we did still see ads like this these days. Just seem so much more real. I'll choose the Maybelline cake mascara because I am looking for some cheap cake mascara now and can't find any. I love cosmetics and I also work in marketing, so naturally I'm intrigued by these! I love the Maybelline mascara ad the most, though judging by the text they weren't really calling it "mascara" back then. It must have been a time when not many women wore mascara, since they're basically explaining what it does! My mum had a YSL cake mascara when I was young, I remember trying it but as I recall it was difficult to build up. Definitely can't beat my Diorshow! What an interesting post! 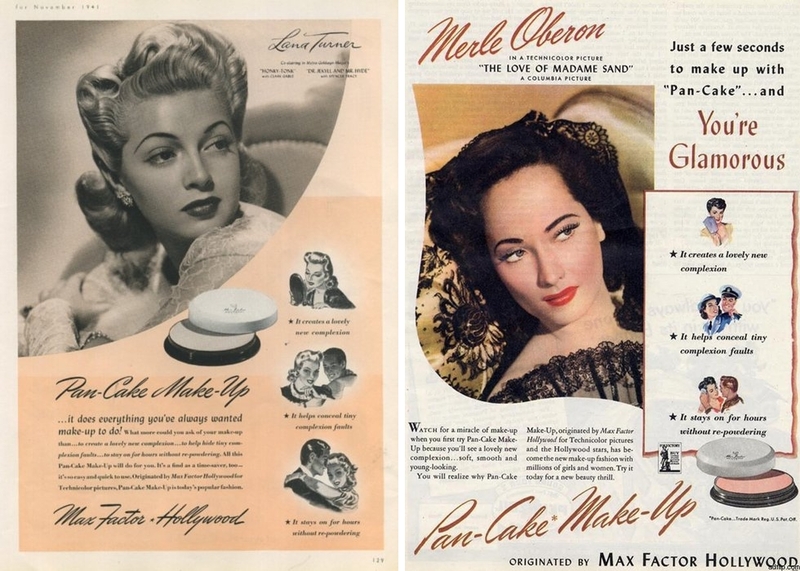 I like the Revlon ad and the Max Factor one. And what a stunner Marilyn is! i love these vintage ads. the women are so beautiful and the ads are so simple yet so effective. i honestly don't think i can pick a favourite! I love how women looked so put together and well groomed. I love the 'Magnetic Nails' one, the red against black and white really stands out. Absolutely loved this! Orange sherbet and cherries in the snow - yum. I love the Marilyn Monroe one, she was amazing. I like the Revlon nail ones too. There is just something about the colour tinting in those ads that I love. This is a really good post - I wish more models looked real in todays ad's, but with airbrushing this will never be the same again. The thing I noticed is how normal yet lovely the model's hands are for Cherries in the Snow?! It's a mad thing to pick up on, but even hands are being airbrushed and slimmed down in ads now, it's bonkers! When will the madness stop! Wow I absolutely love these! 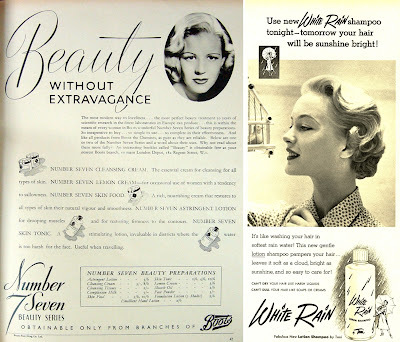 I am into graphic design and adore looking at the changes in ads over the years. Great post! The vintage ads make beauty look so other wordly and glamorous. I hate it when I see Kate Moss/Sienna Miller in a beauty advert only to pick up Heat the next day and see them chuffing away on a ciggie. No thanks! Oh the Max Factor ones are just lovely - and very iconic!!! It's interesting how simplicity was the key then, just a beauty portrait and not much else! Nowadays we have everything, from 3D models to...lash inserts and, still, the ad campaigns aren't that remarkable (on the whole)!